This article, originally published under the title, "Six Strikes against the Nuclear Deal with Iran," has been slightly edited. 1. America the weak: The way in which the negotiations were conducted underscored the weakness of the US. The Obama administration was willing to offer almost unlimited concessions to the skillful Iranian negotiators, ignoring all its own deadlines and red lines. It is clear that President Obama was desperate for a deal in order to leave office with a "legacy." While Washington congratulates itself on a "successful" result, what counts is the perceptions of the countries in the region. Alas, all countries in the region can only conclude that America is indeed weak. America has capitulated to Iran. 2. Nuclear legitimacy: Instead of insisting on the dismantling of all uranium enrichment facilities in Iran, as was accomplished in Libya, the US actually accorded international legitimacy to a large-scale Iranian nuclear infrastructure, including thousands of centrifuges. The deal leaves almost intact all central components of the Iranian nuclear program. ... [T]he US has totally ignored UN Security Council Resolution 1696 of July 2006, which demanded that Iran suspend enrichment activities, as well as American demands for the dismantlement of the nuclear facilities. 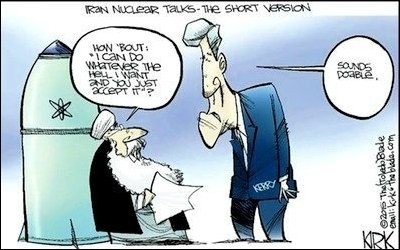 The deal leaves almost intact all central components of the Iranian nuclear program. 3. Proliferation: This agreement is a stimulus for nuclear proliferation. Indeed, Saudi Arabia has announced its desire for "the same type of infrastructure" that has been allowed to Iran. It is to be expected that countries such as Egypt and Turkey will emulate Saudi Arabia. These states share Iranian ambitions for a leadership role in the region and it is highly unlikely they will refrain from acquiring capabilities that match Iran's. Actually, the regional nuclear race has already begun and a multi-polar nuclear Middle East is on the way. This is a strategic nightmare. An American attempt to provide a nuclear umbrella ("extended deterrence") to the Gulf States in order to forestall nuclear proliferation already has failed. Saudi King Salman refused to attend the US-Gulf State summit. This reflects disappointment with what Washington had to offer, and signals Saudi intentions to try to take care of itself on its own. Iran's capacity for subversion and exporting terror will be greatly magnified. 4. Force projection and terrorism: The international sanctions regime against Iran already has eroded. States and businesses already are lining up to capitalize on the economic opportunities emerging in the Iranian market. The unfreezing of Iranian bank accounts and the projected increase in oil production will enrich the coffers of the Iranian regime with more than $100 billion. This will allow the diversion of many resources to an Iranian arms build-up, and will buttress Tehran's aspiration to project force far beyond its borders. Moreover, the cash influx enhances Iranian capability for supporting proxies, such as the Shiite-controlled government in Iraq, Assad's regime in Syria, Hizballah in Lebanon, Hamas in Gaza, and the Houthis in Yemen. The Iranian capacity for subversion and for exporting terror will be greatly magnified. 5. Balance of power: The American decision to accept Iran as a nuclear-threshold state, and Obama's statements in favor of a "responsible Iranian role" in the region, accompanied by an inflated American threat perception of ISIS – signal a most significant change in American Middle East foreign policy. This accord marks an end to Iran's regional isolation. Instead, America seems to be siding with the Shiites against Sunnis. This move changes dramatically the regional balance of power, instilling even greater uncertainty in regional politics. The naïve American belief that Iran can become a "normal" state – will backfire. While cautious, Iran is nevertheless a "revisionist" power trying to undermine the status quo. It does not hide its hegemonic aspirations. Its subversive activities in Shiite Bahrain and the Shiite eastern province of Saudi Arabia (where most of the oil is), and in other Gulf countries, might create an unbearable situation for the West. Eventually, Iran might even attain its declared goal of putting an end to the American presence in the Persian Gulf. An Israeli military strike on Iran has become more likely. 6. Conflict with Israel: American policy is now on a collision course with Israel. The consensus in Israel is that Obama signed a very bad deal, which is dangerous for the Middle East and well beyond it. Israelis, as well as most Middle Easterners, do not buy the promise of a moderate Iran. They know better. Israelis take seriously the calls of the Iranian mobs "Death to America. Death to Israel." Thus, an Israeli military strike on Iran has become more likely, and in the near future – before the US puts the brakes on military supplies to the Israeli army.